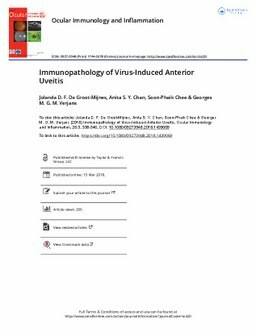 Herpes simplex virus, varicella zoster virus, human cytomegalovirus, and rubella virus are the most common causes of virus-induced anterior uveitis. They can present in a variety of entities not only with typical but also overlapping clinical characteristics. These viral infections are commonly associated with ocular infiltration of T cells and B/plasma cells, and expression of cytokines and chemokines typical of a proinflammatory immune response. The infections differ in that the herpes viruses cause an acute lytic infection and inflammation, whereas rubella virus is a chronic low-grade infection with slowly progressing immunopathological responses. The outcome of an intraocular viral infection may largely be guided by the characteristics of the virus, which subsequently dictates the severity and type of the immune response, and the host immune status.